From June of this year. Copy this link bmews viewers. A God Bless America from Pat. There is nothing for me to add to this hard hitting video from Mr. Condell. This is a must see Condell I video. Sorry I have to do it this way. Am not at my usual puter. I can’t embed from this damn tablet but for tonight,it’s all I have. I think they should play this one everywhere, every day. I think we should all listen to it, every day. This is Pat from a year or two ago I think, when one of those Mad Mo cartoons was in the news. Islam, progressivism, and political correctness will be the death of us all. Rip ‘em up Pat. It’s the truth. Ten thousand Muslims are protesting outside Downing Street and the Ministry of Defence against the publication of cartoons depicting Mohammed. The cartoons – which led to the brutal massacre at the French magazine Charlie Hebdo – were described by the group as a “violation of Islamic law”. The crowd held banners saying “Charlie and the abuse factory” and “learn some manners” as they called for the world to observe Muslim blasphemy rules. The group taunted the grieving families and supporters of the murdered Charlie Hebdo journalists by using the “#JeSuisCharlie” hashtag to tweet pictures of the rally. Men and women were divided within the protest as they waved a huge “Be Careful With The Prophet” banner close to the Cenotaph. The sign was widely taken as a direct threat to British military forces, whose lives are commemorated at the memorial. The protest was organised by the Muslim Action Forum (MAF), which said that the Charlie Hebdo cartoons had helped “sow the seeds of hatred” and had damaged community relations. 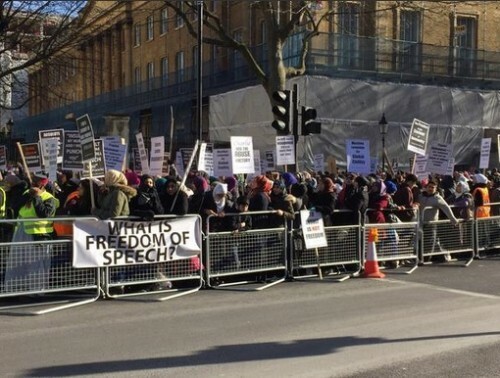 Whilst around ten thousand Muslims attended the protest a total of one hundred thousand signed a petition that was handed in to number 10 Downing Street. It says the production of cartoons of Mohammed are “an affront to the norms of civilised society”. Unmentioned in this, or most other news articles, is that this protest (which may have had only 3,000 attendees) did have a counter protest. 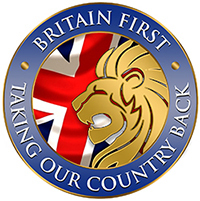 30 or so bold volunteers from the “radical far right” group Britain First spoke up for actual freedom, and an actually free Britain. They were kept well corralled by the police. video link. Listen to the muzzies in the crowd losing their minds in anger at about 9:25. Pat Condell. Need I say more?